Total E&P the Netherlands was looking for a method to conclude an internal innovation day in a appropriate manner and give the participants a relevant souvenir to take home. With regards to the theme “Innovation” the choice for branded VR glasses made perfect sense. "A virtual tour on the production drilling platform"
We were asked to print 200 Cardboards, with a custom Total E&P the Netherlands design. Subsequently we have produced a 360 degree video, the link and QR code was printed on the side of the Cardboard. This way the visitors of the event were able to watch the video in the comfort of their own home. Flying a helicopter to a Total production drilling platform is very expensive. Because Total E&P the Netherlands wanted to show their employees how the platform looks, this subject was chosen for the production of the 360 video. 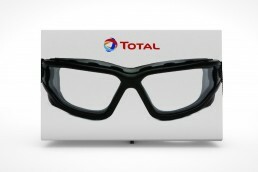 Total E&P the Netherlands was already in possession of various 360 degree photos of the production drilling platform. In collaboration 15 photos were selected. The photos were subsequently used in a running two minute video. 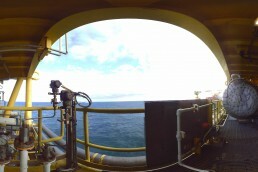 In the 360 degree video the viewer experiences a guided tour on the drilling platform. The graphics show the current location on the platform. The video is further enhanced using sounds of the machines and the sea.